This lore and gameplay update is part of Interactive Lore Event V: The Beginning of the End. 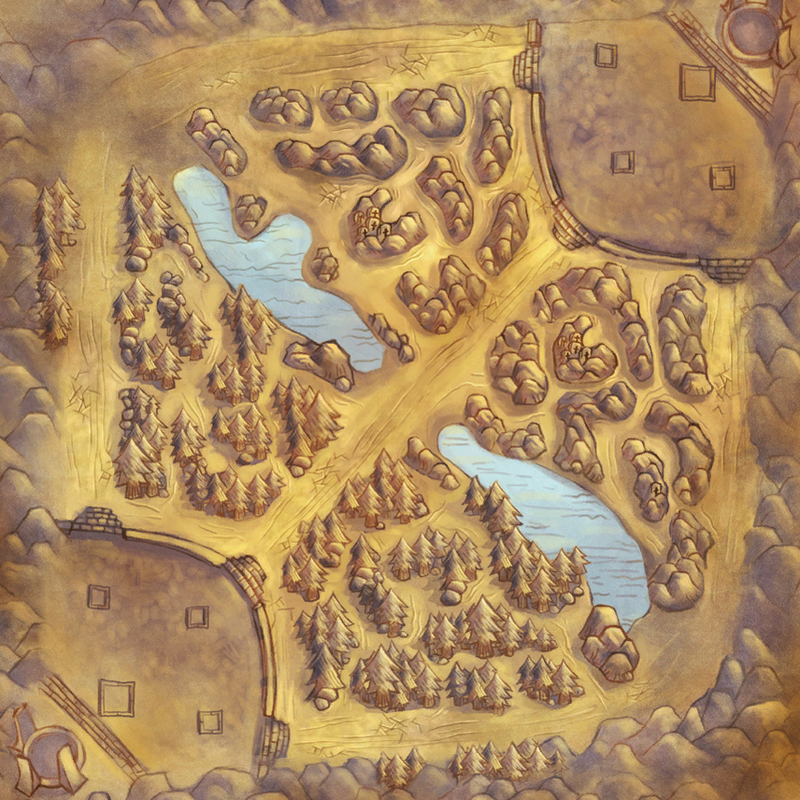 King Jarvan III stood before a table bearing a model of Summoner’s Rift, in a great hall awash with the sound of a hundred earnest voices echoing against stonework. The hall’s cavernous immensity softened what would elsewhere have been a roar to a murmur, a murmur which warmed the room as a fire warms a hearth. The King had gathered his Champions and Summoners here in the wake of Demacia’s narrow defeat on the Fields of Justice in the tournament the day before. He wore simple summer robes of pale cyan, the golden crown upon his head and the steel broadsword at his waist the only burdens of court regalia he chose to bear among his closest friends and advisors. Spread out across the room were dozens of tables and diagram boards, with which they labored to devise a strategem to end Zaun’s control over the dark sand. “Show me that again,” he said. He had heard of Malzahar alone vanquishing both Vayne and Leona during the tournament, and now began to understand how this could have transpired. Leona frowned, and seemed on the verge of reply when the room fell silent. King Jarvan felt an undeniable presence by his side, and heard the collective whisper of the room’s astonished occupants once more remembering to draw breath. He turned his head and saw Ceruleana, Demacia’s patron goddess of the ocean, standing just beside him in her cloak of stormcloud gray. Ceruleana, who with a wave of her hand had obliterated the Noxian fleet on its way to Ionia. If a goddess can be surprised, then Ceruleana seemed surprised to find that stunned silence was her only answer. His breath left him in a ragged gasp. An icy wind lifted him into the air and slammed him down onto the table. She spoke, without the beating-heart pauses of human speech but only the swelling immensity of a tidal wave. Her soft voice became a roar, never halting, only churning over itself until it shook the walls. He saw her hand fall, and the gale crushing him against the table faded away. He rasped and wheezed for precious breath. Jarvan III staggered to his feet. After several breaths, he gained the strength to straighten his robe and set his crown aright. And so the debate continued, until at last the King gazed up at the glittering pane of stained glass, on which was depicted the founding of the Institute of War. The last rays of daylight died upon the pane. Swain squinted at the page. He scribbled something out, dragging the quill’s nib off-point through the blob of ink in a downright barbaric way. He smirked, and gave the legate an absent-minded response. “Exhausted. Yes. Of course they are.” He scratched out another phrase and drew a small diagram mostly consisting of “x” marks. Swain was distinctly unimpressed by his analysis. “Exhausted troops don’t spontaneously attack fortifications,” he sneered. “I intend for them to be confused. I intend for them to lose control of the perimeter and fall back. I intend for the rebels to see an opportunity. I intend for the most cowardly of these traitors to come out of hiding and march with the rebels. Then I intend to rotate the reserve cohorts into battle and put their rebel heads on CHOPPING BLOCKS.” He slammed his palm against the table with more hatred than the Legate had ever seen from an executioner delivering a death blow. Swain stood. As Beatrice fanned her wings, he lifted his cane and pointed at a sealed scroll the other man carried. “Give me that.” He took it into hand, used his signet ring to lift the sealing hex in a little hiss of black smoke, and spread the thick paper out over his desk. “Twelve and a half days,” Swain corrected, with barely a moment for the mental calculations. He dismissed the entire matter with an irritable wave of his hand, as though brushing off a chalkboard. “No. The timing is all wrong!” His eyes tensed. Swain hardly seemed to be listening. He traced his finger slowly along the whispering parchment, gleaming with arcane seals and shadowy hidden messages. His response came in a distracted mutter. “Their prince would have been grandstanding about that for days in the Council.” Without looking up, he struck his cane against a black iron bell hanging overhead. The result was felt more than heard as the walls resonated with the call that summoned the Praetorian Legion to the Grand General’s chambers. Heavy footfall pounded up the steps. Beatrice hopped from Swain’s shoulder and landed on the map. Her claws pattered as she paced about. Swain seemed to share her agitation. The door flung open. The commander of the Praetorian Legion burst into the room with ten of her soldiers behind her, answering the emergency summons, obviously expecting to find a roomful of assassins. Her sword was unsheathed in her right hand, and her left hand blazed with black fire. Swain turned to them. “ATTENTION!” The well-drilled soldiers seamlessly stepped into line from their combat footing and stamped the hafts of their axes into the floor. Demacia marches its army to the Great Barrier. 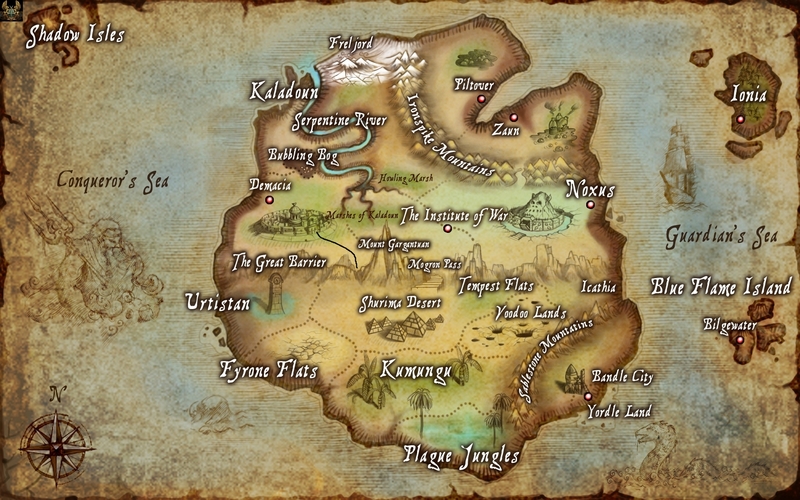 The mightiest army in Valoran stood before the immense mountain range called the Great Barrier. King Jarvan III rode to the fore astride a white pegasus armored with enchanted silver. The pegasus swept out its wings and rose up into the air. The King of Demacia held aloft an amulet given to him by Janna, who was called the Storm’s Fury. The winds began to whistle, and then to howl. A gust snatched the amulet from Jarvan’s hand. It vanished into the clouds, which began to part. Priests chanted as Summoners knelt, pressing their hands to the earth. Lux, for once, had no answer. She looked up as the winds split the clouds. Later, she could only describe it by saying that the sky burned blue, tongues of something like fire piercing the wisps of cloud and pulling them into the blue infinity. Garen struck his sword into the ground and knelt, bowing his head. Lux sensed a strange old magic coursing through the rocks and dirt, toward her brother. When they wave reached him, every cloud in the pure blue sky had been seared away, and a column of light flashed down to illuminate him, between the might of the earth and the brilliance of the sun. 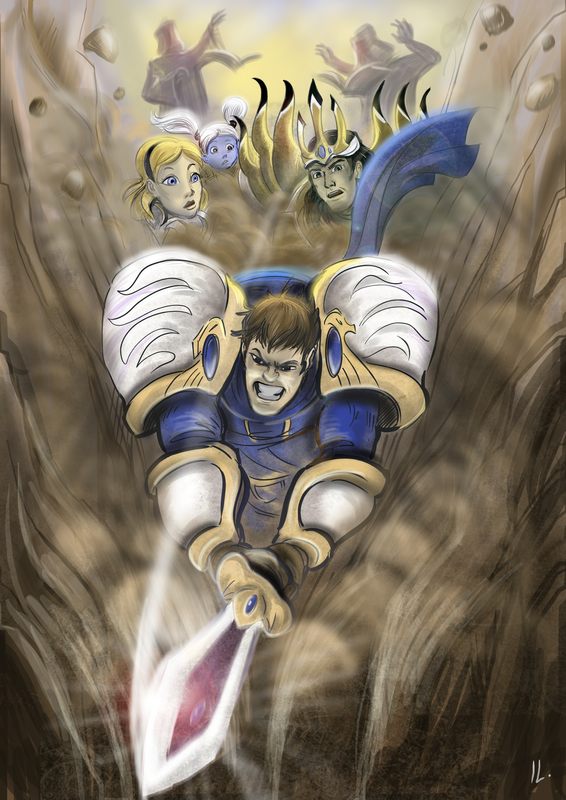 Garen lunged to his feet, blade in his hands, and charged headlong toward the mountain. With one great overhanded swing, he struck, and cleaved the rock apart. The blow tore the mountain in half. Boulders crashed and a cloud of dust filled the plain, like blood gushing from the chest of a slain foe. As the wind swept it aside, the coughing soldiers saw the path opened before them, and their Champion turned to face them. The army raised its weapons as one. The battle for Shurima Desert will take place this Sunday, June 29. We will hold a best-of-three set of matches between Demacia and Zaun. The outcomes of these matches will not necessarily be dispositive as to how the battle plays out, but will have a significant impact. Summoners declared for Demacia, Piltover, and Bandle City will all be eligible to fight for Demacia in these matches. The Demacian team will be allowed to bring up to two Champions per match from the Bandle City and Piltover rosters. Zaun will be able to take up to two Noxian Champions per match from the following list: Cassiopeia, Darius, Draven, Katarina, LeBlanc, Morgana, Sion, Sivir, Swain, Talon, Urgot. The Pharmakon II bonus will be in effect, rolled at d8 if they want to ban a Demacian Champion, or d6 if they want to ban either Piltover or Bandle City Since these matches are not “actual” League matches but a representation of combat, no sanctions will apply. This is more detail than I’d normally include, but I know people are curious, so here you go. If you want the tl;dr: it’s going to be a pitched battle, with the outcome of the Featured Matches playing a pivotal role. War is risky, and chance will matter as well, especially as to (e.g.) which units are lost on each side. Bear in mind that the Strength values given for units are average values; different units have different variance profiles. The battle will consist of three rounds of military system combat, with a significant strength increase for whichever side prevails in the Featured Matches. (+25% for winning 2–1, and +50% for winning 3–0.) To drive Zaun back and destroy the mines, Demacia will need to win a round with an effective Strength at least 33% greater than Zaun’s — not an easy task. If it seizes control of the mines in one round, Zaun will have to in turn beat them by 33% in a subsequent round to retake the mines. Even if Demacia wins all three rounds, if it never hits this critical point, Zaun will win by default as the League intervenes to halt the fighting. Summary: Piltover’s sabotage of the warpgate may just give Demacia the time it needs to overcome the fortifications with an initial push. Demacia itself has a total attacking Strength of about 94 Strength. Zaun will have 46 Strength on-site when they attack: HexKorps Armored Division III (Strength 15) and Giant Death Robots (Strength 26), plus the highly mobile War Zeppelins (Strength 5) which will be able to reach the desert by flight. Piltovian sabotage will shut down the warpgate for the first round; if it had been operational, HexKorps Armored Division I would have been instantly warped from Zaun to Shurima in time of the first round. HexKorps Armored Division II (Strength 15) will still be locked down in Noxus for the first round. Both Piltover and Bandle City chose to cast their lot with Demacia. As a result, in the first round, Bandle City will send the Screaming Yipsnakes (Strength 5), and Piltover’s Special Shuriman Expeditioneers (Strength 8) will join the combat with a strafing run of the just-completed Airship Armada’s ultravelocity aircannons. 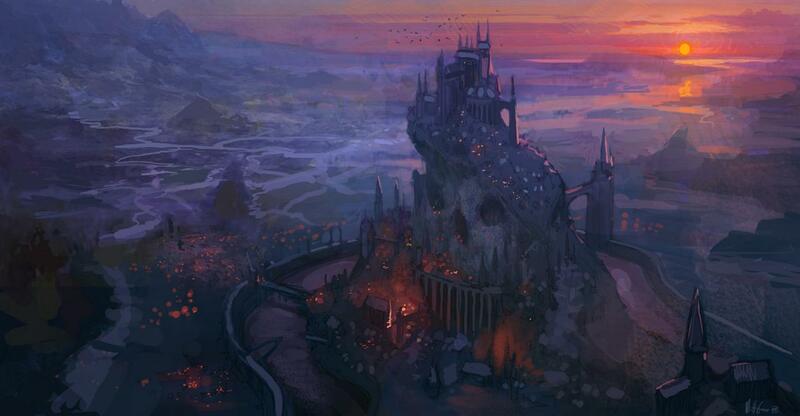 Summary: Noxus will fully commit to the battle, arriving alongside the rest of Zaun’s forces. Zaun will pick up a total of about 60 Strength. Zaun’s engineers will restore the warpgate just as Swain finishes putting down the rebellion. (That was also a close roll, by the way, with the deployment of the HexKorps having proven decisive.) Through the gate will come HexKorps Armored Division I (Strength 15) and Zac’s mutants (Strength 9). They will bring with them two Noxian legions, the Nightmare Cavalry, and the Executioners (total Strength 36). (They picked up the extra legion and the Executioners because they’ve begun Noxian Decontamination — even though Bandle City sabotaged it for this week. It’s the thought that counts.) All in all, Zaun will gain about 60 Strength in reinforcements. Piltover’s airships will fly back to Piltover during this round to reload and pick up more troops. Summary: Piltover will return for one more airship strafing round, and will deploy another rifle company. This will be the last round of combat before the League intervenes. If Demacia holds the mines, it will try to exorcise the Void from within them. So, was Ceruleana right? A roll of the dice will resolve that question; there are a range of possible outcomes. Depending on the details of that roll, the Battle of Shurima might be immediately followed by a Void onslaught, if Demacia does not successfully purge the mines. Malhazar’s controlling them, pretty sure he’s got the necessary research for that being their Prophet. Perhaps this is where Extradimensional Theory’s smite resistance can pull its weight with the Zaunites protecting the swarms.